The dial is in a plaza located on the northern edge of the campus of Texas Christian University near the intersection of University Drive and West Cantey Street in front of TCU's Walsh Center for the Performing Arts. The octagonal pedestal of limestone has open arches to view a meridian date line. When the sun is on the meridian, a sunbeam from a slit in the southern support of the pedestal projects light onto a line with date and zodiac house. In the corners of the octagon are symbols for the Sun, Moon, Mercury, Mars, Jupiter, and Saturn. 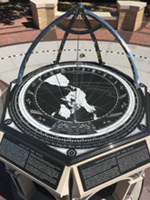 Surrounding the dial in a plaza is a large compass rose. There is a chapter ring at the edge of the compass rose inlaid with the distance to 196 capital cities and their azimuthal directions. At the north point is TCU's Horned Frog. Time is too short for those who wait, too swift for those who fear, too long long for those who grieve, too short for those who rejoice. But for those who love, time is not. Six plaques surround the pedestal giving the history of the longitude dial and how to correct for the equation of time.